Such a move would be a massive undertaking. The Philippines military is deeply entwined with its U.S. counterpart and overwhelmingly uses U.S. equipment. BEIJING — Philippines President Rodrigo Duterte said Wednesday he wanted American troops out of his country, perhaps in the next two years, underlining his intention to press ahead with a major realignment of his country’s foreign and security policies. It is not the first time Duterte has made this kind of threat, but his two-year timetable for a U.S. military exit appeared designed to reinforce his break-the-mold message to Washington and neighbors in Asia, particularly powerhouse China. So far, however, his administration has failed to follow through on previous pledges to remove a small contingent of U.S. counterterrorism troops from the southern island of Mindanao or to notify Washington of an end to military exercises. The Philippines is one of the oldest U.S. allies in Asia, and hosted permanent U.S. military bases until they were evicted in 1992. It is also an important Pentagon counterweight to China, whose expansion plans into the South China Sea has dismayed the Philippines and other nations. “I want to be friends to China,” he told an audience of business representatives in Tokyo, the Associated Press reported. Duterte’s brash style and off-the-cuff remarks have confused and confounded many other countries, with his own cabinet often in the dark about what he will say next, and forced to play damage control. Last week in Beijing, Duterte announced his “separation” from the United States, only to later row back his comments and say he did not want to sever economic or military ties with Washington. But this week he has gone on the attack again, threatening Tuesday to end a defense cooperation agreement with the United States that allowed U.S. forces regular access to Philippine military bases. On Wednesday, he was even more specific. Cutting military ties with the United States entirely would be a massive step for Duterte. The Philippines military is deeply entwined with its U.S. counterpart and overwhelmingly uses U.S. equipment. But he has the executive power to abrogate the Enhanced Defense Cooperation Agreement, a 10-year deal signed in 2014, which allowed the United States to deploy conventional forces in the Philippines for the first time in decades, rotating through five bases. The deal was heralded as a key element of President Barack Obama’s strategic rebalance to Asia. He could also end annual joint military exercises with the United States and cancel plans to hold joint patrols in the disputed waters of the South China Sea. “For now, the U.S. is trying to downplay Duterte’s rhetoric,” he said. But many experts say it would be wrong to write off Duterte’s comments as pure bluster, given his history of resentment towards the U.S. troop presence in his country. But Duterte can even be confusing and contradictory during the course of the same day. On Wednesday, he also said he had only been in Beijing the week before to talk about economics, not arms or alliances, and said he would stand on Japan’s side in the South China Sea. Japan does not have a claim to the disputed waters of the South China Sea, although it does have a separate dispute with China in the East China Sea. 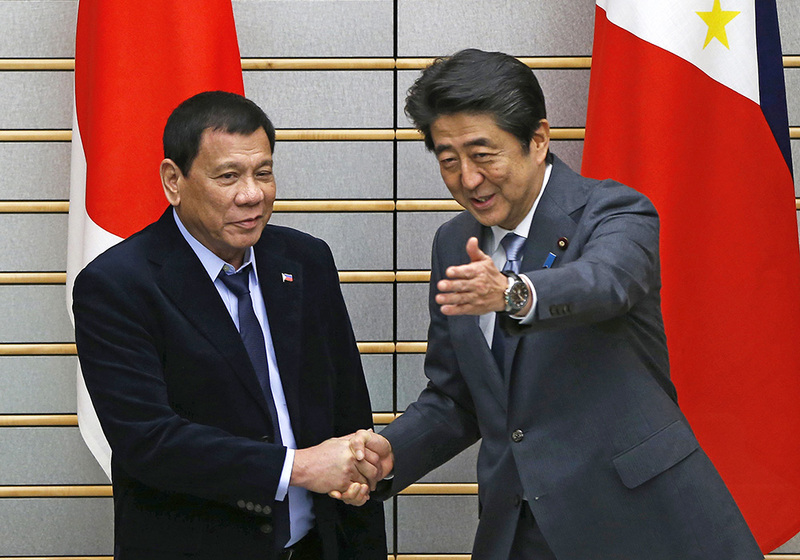 Japanese Prime Minister Shinzo Abe had been hoping to play a mediating role between Duterte and Washington during this visit, but the Philippine president’s latest remarks show just how difficult that will be. The Philippines is one of several nations locked in a maritime territorial dispute with China over the South China Sea. After China took control of the Scarborough Shoal, an area of rich fishing grounds off the Philippine coast, in 2012, Manila took Beijing to an international tribunal in the Hague. It won an important victory in July after the tribunal ruled that China’s expansive claims to the disputed waters have no legal basis. But, to the frustration of other claimants, Duterte has since agreed not to raise the tribunal’s ruling in international meetings and instead start bilateral talks with China over the issue. In return, he secured a Chinese pledge to step up investment and lending to the Philippines, especially for infrastructure. But it is far from clear that he has secured any concession in the maritime dispute.